Scaffolding is one of the primary methods used to elevate and support workers for construction projects. At Drake Scaffolding Services Ltd, we offer commercial scaffolding services across the whole the South West. We understand the need for your personnel to move around your construction site safely and with ease. This is the reason why we make sure our South West commercial scaffolding services offer your workers complete safety, so that they do not have to worry about protection while working at heights. With our assistance, you can minimise the chances of falls and injuries. Feel free to give us a call if you need more information. In addition, you can have your peace of mind knowing that our health and safety team will complete a thorough risk assessment and survey reports, ensuring safety and convenience. Whether you are working on a commercial construction project or an industrial build, our specialists will make sure that your workers are able to work in a safe and secure environment. With our help, your builders and contractors will be able to access even the most difficult areas with ease. We always ensure that all the health and safety regulations are followed while doing our work. 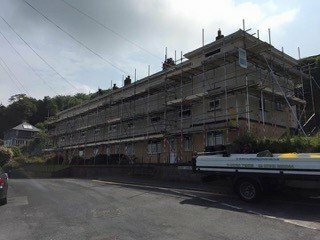 Our expertise and technical knowledge make us the perfect people to help you with your South West commercial scaffolding needs. 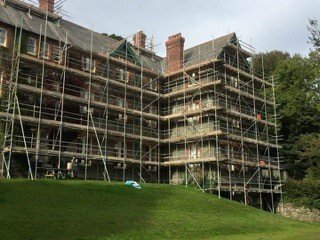 If you are looking to get a scaffolding survey done for your building project, look no further. At Drake Scaffolding Services Ltd, we deliver complete safety and quality inspections at an affordable cost. At Drake Scaffolding Services Ltd, we are specialists in providing temporary roof installation for commercial and industrial buildings across the South West. We have worked closely with a number of well-known roofing companies and property developers in the past, and are their preferred contractor when it comes to temporary roofs.